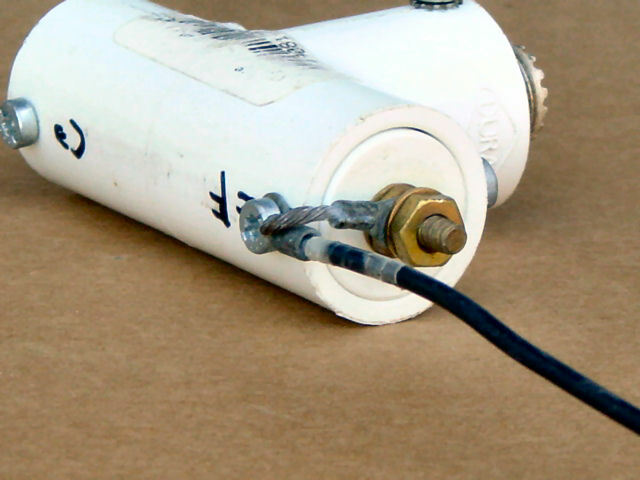 Ham Radio Center Feed Point Connector For Dipole Antenna | The Wonderful World of Microcontroller! The Experiment: In this experiment were going make a Ham Radio Center Feed point Connector for a Dipole Antenna. 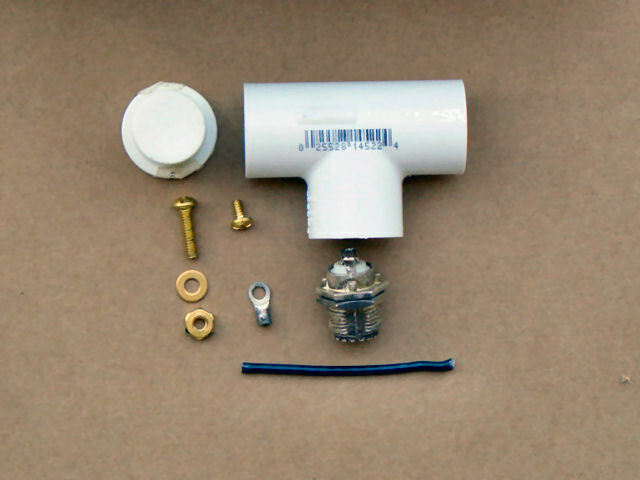 Will use a readily available half inch PVC fittings to construct a strong light weight Dipole Center Feed Point Connector. 1. Drill a 11/64 hole in the center of the 1/2″ PVC Pipe Plug. 2. Cut 1/2″ PVC Pipe Plug in half. 4. Strip back 1/16″ of insulation of each end of 2″ #14 wire. 5. Solder Ring terminal connector to one end of 2″ #14 wire. 6. Bend the Ring terminal ring back 90 degrees opposite the wire. 7. Drill out the Ring terminal to 9/16″. 8. Screw the 3/4″ 8-32 brass screw into Ring terminal. 9. Insert 3/4″ 8-32 brass screw from into the center hole in the PVC Pipe Plug. *Note: Line the Ring terminal wire into the slot..
10. Screw a 8-32 brass nut/washer/nut on the 3/4″ 8-32 screw. 11. Slide PVC pip plugs into the PVC Tee ends, with the ring terminal positioned to the top of the PVC Tee. 14. Insert the PL-259 into the Tee connector. Note: All drilled hole are smaller then the screw so that screw can cut treads into the PVC. 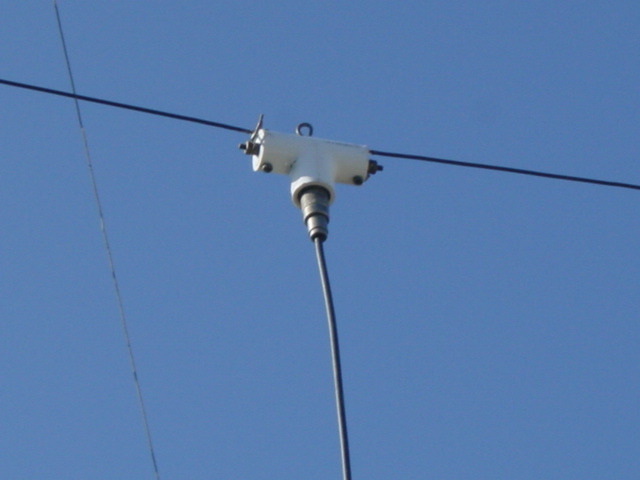 Connecting the antenna wire to the Dipole Center T Connector. Striped back 2″ of insulation of the #14 stranded wire fed that though a ring terminal, then placed a spade terminal on the end bent back the wire on the ring terminal and soldered both to the wire. Now connect the ring terminal to the screw on top of the PVC T and connect the spade terminal between the #8-32 nut and tighten nut snugly. Don’t forget to add the addition wire to the antenna wire length. 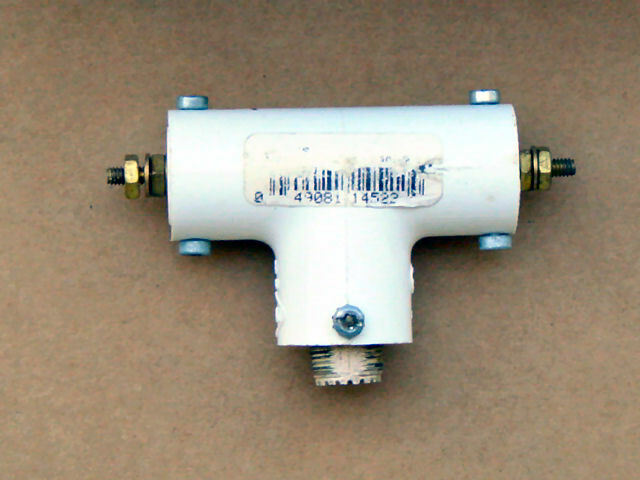 PVC Tee connector make a very nice Center Feed Point Connector for Dipole Antennas.